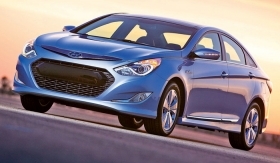 The Hyundai Sonata Hybrid can go up to 75 mph on electric power. The powertrain in the new Hyundai Sonata Hybrid is significantly different from those in other hybrids. One result is class-leading highway fuel economy. The Sonata Hybrid can go up to 75 mph propelled by its electric motor. This velocity far surpasses the top speeds in electric-vehicle mode of competitive hybrids, including the Ford Fusion Hybrid and Nissan Altima Hybrid, and cuts the Sonata's fuel consumption. The EPA rates the Sonata's highway fuel economy at 40 mpg. Better aerodynamics help boost fuel economy: Shutters behind the grille close at highway speeds and the car's underbody is sculpted to reduce drag. But the new Sonata's fuel economy is mainly because of its innovative powertrain. The challenge, says Mark Guin, Hyundai senior development engineer at the Hyundai-Kia America Technical Center in Chino, Calif., was to "come up with our own hybrid system while working around existing patents." Says Guin: "We believe that the solution we came up with is elegantly simple." Hyundai's solution replaces a typical hybrid's transmission-motor assembly with a standard automatic transaxle modified to work with what Hyundai calls a transmission-mounted electrical device. The TMED includes two main parts: a powerful electric drive motor and a solenoid-activated clutch pack. These parts fit in about the same space as a traditional torque converter. "The fine control we can exert over the wet clutch pack makes it possible for us to use a conventional automatic transmission without a torque converter," a notorious energy drain, Guin says. "The TMED enables our 40 mpg highway mileage and high-speed EV operation. Because the torque from the motor runs through all of the transmission's six gears, we can keep the motor running at its optimal rpm," Guin says. Electric motors are more efficient running at lower speeds. The clutching system enables the gearbox to receive power from the 30-kilowatt (40.8-hp) electric motor, the 166-hp 2.4-liter Atkinson cycle four-cylinder gasoline engine, or both. The vehicle's ability to run on any mix of engine or motor power means the Sonata is a parallel hybrid. (In a series hybrid, the driven wheels only receive power directly from the electric motor.) Hyundai rates the combined horsepower of the powertrain at 206 hp. Hyundai Mobis Co. of Seoul supplies the main motor. The starter motor-generator comes from S&T Daewoo Co. Remy International Inc. supplies the starter motor in the non-hybrid Sonata. The large drive motor in the TMED also captures energy from regenerative braking. It is not the only motor-generator in the Sonata's hybrid system. Like the eAssist system that will be used on the 2012 Buick LaCrosse, the Hyundai hybrid uses a belt alternator-starter motor that is connected by a drive belt to the engine's crankshaft. Hyundai refers to its motor as a hybrid starter-generator. The hybrid starter-generator motor is rated at 8.5 kilowatts, significantly less than the eAssist's 11 kilowatts, but more than the 2007 Saturn Vue Green Line Hybrid's 2-kilowatt belt alternator-starter. Hyundai's does not provide torque to the engine beyond what is required to repower the engine for stop-start. Another departure from most hybrids is the Sonata's batteries. LG Chem partnered on the development of the 270-volt, 1.4-kilowatt, 72-cell lithium polymer battery array. The new manganese-spinel cells perform better than nickel-metal hydride batteries by holding more power in less space and at a lower weight. Compared with other battery chemistries, Hyundai notes that lithium polymer cells hold a charge 25 percent longer than nickel-metal hydride cells, helping the Sonata start and drive away on electric power even after the sedan has been sitting for several days. This further reduces fuel consumption and emissions. A conventional 12-volt automotive battery is still required to help power vehicle accessories. Nearly all hybrids perform better in urban driving, but Hyundai market research found that the typical American driving cycle favors highway driving (about 58 percent highway to 42 percent city). This revelation influenced the engineering decisions used to create Hyundai's first hybrid to be marketed in the United States. The Sonata Hybrid's EPA figures are 36 mpg city, 40 mpg highway, giving the Sonata Hybrid the best highway mileage of any mid-sized sedan, including its hybrid rivals. And, Hyundai says, it stands out in other ways, too. "In blind evaluation drives with consumers," Guin says, "drivers told us that the Sonata Hybrid felt more 'normal' than other hybrids."